Our 2018-2019 Learn to Skate Programs …Something for everyone. Programs are available for Mondays, Wednesdays, Fridays, Saturdays, and Sundays. Pick the day and time that works best for you. Instruction covers beginner to freestyle level curriculum from the United States Figure Skating Association, as well as the USA Hockey, and American Development Model for Starter and Developmental Hockey making your hockey player a star! Our popular After School Programs run on Monday and or Friday during the school year with extended hours for an Elite Learn to Skate class for schools with later dismissal times. Our one-way bus program is available for all schools with 6 or more participants. Contact Elisa 440 543-3884 to arrange transportation from your school. 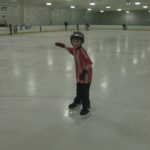 Register for Learn to Skate Online! **REFUND POLICY: Please choose your session carefully. Once the session begins, there will be no refunds. Students assume the risk of change in personal affairs or health.